The public is now evenly divided on the question of whether churches and other houses of worship should express their views on day-to-day social and political questions: 49% say they should do this, while 48% say churches and other houses of worship should keep out of political matters. During the last midterm election season, in 2010, those who wanted churches to keep out of politics outnumbered those who wanted churches to express their political views by a 52% to 43% margin. Among Republicans and those who lean toward the Republican Party, nearly six-in-ten (59%) now say that churches should express their views on social and political issues, up 11 percentage points since 2010. By contrast, there has been virtually no change on this question among those who support the Democratic Party; 42% of Democrats and those who lean Democratic say churches should express their political views, while 55% say churches should keep out of politics. Two-thirds of white evangelical Protestants (66%) now express support for having churches speak out on social and political issues, up from 56% in 2010. Nearly six-in-ten black Protestants (58%) also say churches should express their political views, as do roughly half of Catholics (48%) and white mainline Protestants (49%). 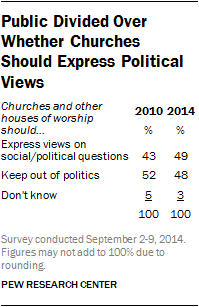 Most of those who have no religious affiliation say churches and other houses of worship should keep out of politics (65%), with just 32% saying churches should speak out on political matters. The poll also finds a modest but noticeable increase in the share of Americans saying there has been “too little” expression of religious faith and prayer from political leaders. Currently, 41% say there has been too little religious talk from political leaders, while 30% say there has been too much and 23% say there has been about the right amount of religious speech from politicians. During the last midterm campaign, 37% said there had been too little religious talk, 29% said “too much” and 24% said there had been about the right amount. Most Republicans and those who lean toward the GOP say there has been too little (53%) or the right amount (24%) of religious talk from political leaders, with just 17% saying there has been too much of this kind of discussion. By contrast, a plurality of Democrats say there has been too much religious talk from political leaders (40%). Most white evangelical Protestants (68%) say there has been too little expression of religious faith and prayer by political leaders. At the other end of the spectrum, most religious “nones” (56%) say there has been too much religious talk from politicians. Other religious groups express more mixed opinions on this question. Most Americans continue to oppose the idea of churches endorsing particular candidates during political elections, with roughly twice as many people saying churches should not do this as saying they should (63% vs. 32%). Even on this question, however, there has been significant movement in the direction of more support for religious involvement in politics. In 2010, just 24% said churches and other houses of worship should come out in favor of one candidate over another, 8 points lower than in the current poll. Majorities of both Democrats and Republicans oppose church endorsements of political candidates, though Democrats oppose this in larger numbers than Republicans. Among all major religious groups, there is more opposition than support for church endorsements of political candidates. Roughly six-in-ten Americans (59%) say it is important for members of Congress to have strong religious beliefs, a number largely unchanged since the 2010 midterm cycle. Nearly three-quarters of Republicans and those who lean toward the Republican Party say that members of Congress should have strong religious beliefs (72%). Democrats, by contrast, are evenly divided on this question, with 50% saying it is important for members of Congress to have strong religious beliefs and 48% expressing disagreement with this sentiment. Most people who identify with a religion, ranging from 83% of white evangelicals to 59% of white Catholics, say it is important for members of Congress to have strong religious beliefs. By comparison, two-thirds of religious “nones” (68%) disagree with the sentiment that it is important for members of Congress to have strong faith. 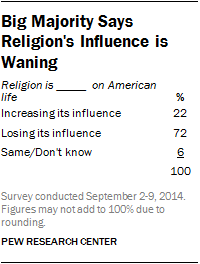 Nearly three-quarters of Americans (72%) now say that religion is losing influence in American life, the highest share to hold this view in Pew Research surveys going back to 2001. 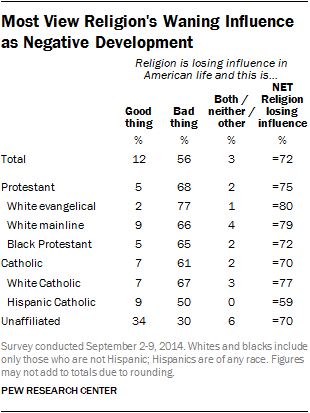 As in previous surveys, most people who say religion is losing its influence in American life see this as a negative development, with 56% of the public as a whole saying it is a “bad thing” that religion is losing sway in the U.S. The concern is most pronounced among white evangelical Protestants, 77% of whom say religion is losing influence and that this is a bad thing, but is shared by majorities of white mainline Protestants (66%), black Protestants (65%) and Catholics (61%). The religiously unaffiliated who see religion’s influence as waning are evenly divided over whether this is a positive or a negative development. Among the minority of people who say religion’s influence is growing in the United States (22%), there is a much more even balance of opinion over whether this is a good thing or a bad thing. Currently, 12% of Americans say religion’s influence is growing and that this is a good thing, while 10% say religion’s influence is growing and that this is a bad thing. In previous surveys, those who perceived religion’s influence as growing and saw this in a positive light consistently outnumbered those who viewed it negatively, often by a margin of roughly 2-to-1 or more. Which Institutions Are Friendly Toward Religion? Roughly half of adults (47%) think the Republican Party is friendly toward religion, with 30% saying the GOP is neutral toward religion and 15% saying it is unfriendly toward religion. Far fewer (29%) see the Democratic Party as friendly toward religion, with 39% describing the Democratic Party as neutral toward religion and 25% describing it as unfriendly toward religion. Public opinion on these questions has fluctuated over the years. But the GOP has consistently been rated as friendly toward religion by more people than has the Democratic Party. The GOP is seen as friendly toward religion by most Republicans and those who lean toward the GOP (58%), as well as by a plurality of those who support the Democratic Party (44%). Democrats are divided over whether their own party is friendly (43%) or neutral (46%) toward religion, while about half of Republicans (49%) say the Democratic Party is unfriendly toward religion. The share of Americans who rate the Obama administration as friendly toward religion has declined sharply in recent years. Currently, 30% say the administration is friendly toward religion, down from 37% in 2009 and 39% in 2012. Nearly three-in-ten (29%) see the Obama administration as unfriendly toward religion, up from 17% in 2009 and 23% in 2012. The share of Republicans rating the administration as unfriendly toward religion has risen by 22 percentage points since 2009. But even among Democrats and those who lean toward the Democratic Party, there has been an 11-point decline in the share rating the Obama administration as friendly toward religion. Many from this group have moved into the “neutral” category; the administration’s “unfriendly” rating has risen just 4 points among Democrats and those who lean Democratic. The survey finds significant increases in the view that the Obama administration is unfriendly toward religion across several religious groups. Among both white evangelicals and white Catholics, the administration’s “unfriendly” ratings have increased by 19 percentage points since 2009. Evangelical and Catholic leaders have been vocal opponents of the Affordable Care Act’s contraception mandate, which they view as restrictive of religious liberty. 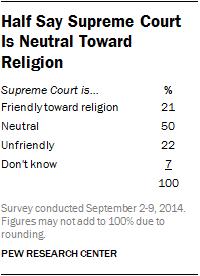 Half of the public views the Supreme Court as neutral toward religion, with roughly equal shares describing the high court as friendly (21%) or unfriendly (22%) toward religion. Nearly six-in-ten Americans (59%) say they think Muslims face a lot of discrimination in the U.S. today. Far fewer think other religious groups – including Jews (32%), evangelical Christians (31%), atheists (27%) and Catholics (19%) – face a lot of discrimination. 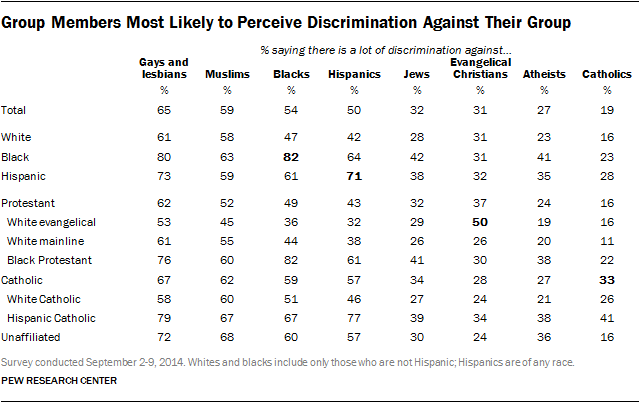 About two-thirds of Americans think gays and lesbians face a lot of discrimination in the U.S. today (65%), and half or more say this about blacks (54%) and Hispanics (50%). These findings are broadly similar to the patterns observed in a 2009 Pew Research survey that included many of the same questions. Relatively few religious “nones” (8%) say it has become more difficult in the U.S. to be a person with no religion in recent years; most religious “nones” say it has become easier (31%) to be a person with no religion or that it hasn’t changed much (60%). 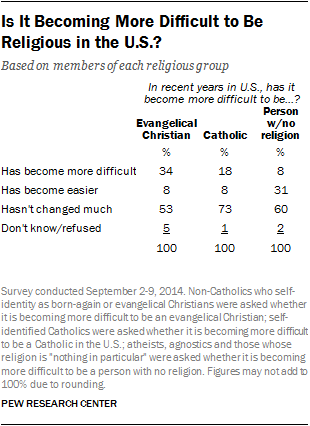 Similarly, nearly three-quarters of Catholics (73%) say the ease or difficulty of being Catholic in American society has not changed much in recent years. By comparison, evangelicals are less sanguine about their position in American society, with one-third (34%) saying it has become more difficult to be an evangelical Christian in the U.S. Consistent with this, three-in-ten white evangelical Protestants say they think of themselves as a religious minority because of their religious beliefs. One-quarter of black Protestants (26%) say the same. Fewer Catholics (13%) and white mainline Protestants (10%) say they consider themselves religious minorities.